Our first test was to start up our ATS-V. The ambient temp was 80°F. we let it idle until the ECT stabilized rose to 212° which is just below the car’s fan-on temperature. Then we set the Fast&Cool in front of the car. With the unit sitting on the floor, it’s outlet was pointed right at the V’s cooling air intake. We turned the Maradyne on high and waited. Within five minutes the ECT was 201 and at the end of 15-min. it was 190°. Clearly, the Fast&Cool does very well as an auxiliary cooling fan. In the V-Net testing shop, we’ve been evaluating a Maradyne “Fast&Cool Air Blower” and we use it for two different purposes. Occasionally, when we have a car idling for a long period, we need a fan to increase cooling air flow though the car’s radiator. An example might be if we are recording engine controls data during a long period of idle and we’d prefer the engine coolant temperature (ECT) to stay normal or close to it, rather than rising to a high ECT typical of a long idle period. Secondly: we take cars to the chassis dyno on a regular basis. The facility we use is WesTech Performance Group in Mira Loma, California. They have two giant fans which are positioned ahead and behind the car, however, units like the Fast&Cool, with their specially-shaped outlets, are preferred over a box fan or circular fan to an industrial floor blower for extra cooling air flow is that they can be “aimed” at the front of the car. That way, much more of the air flow goes into a car’s cooling air intake and less goes over or around the front of the car, bypassing the cooling air intake. The “Fast&Cool Air Blower” (PN MFC2200) is made by engine cooling fan specialist, Maradyne High-Performance Fans. The housing is made of tough, durable rotomolded polyethylene. It’s has a two-speed, 115-volt, 1/3-hp electric motor which spins a squirrel cage blower. The motor draws 2.3-2.5-amps, depending whether you select low- or high-speed. The Fast&Cool has a 25-foot cord. On high, the blower turns 1100-rpm and moves 3000 cubic feet of air per minute. The unit is also fitted with a duplex GFCI which allows one to “daisy-chain” more than one Fast&Cool or plug in some other device, so, because of its robust electrical design, if you are a big fan of fans; you can connect as many as four Fast&Cools on one circuit. The Fast&Cool, due to it’s robust construction and powerful motor is a bit hefty at 30-lbs, but that is typical of this type of shop blower. 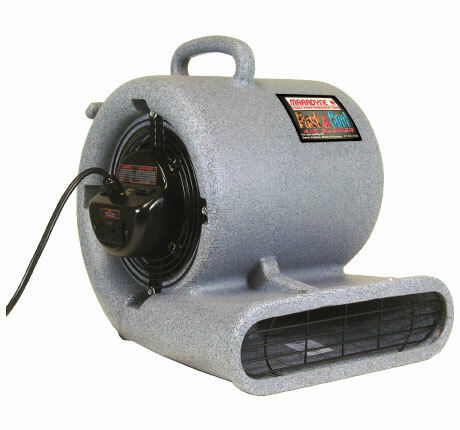 If you need a shop fan which blows low to the ground, the Fast&Cool is a darn good choice. For more information visit the Maradyne High-Performance Fans web site at http://www.maradynehp.com or call: 800.403.7953.